The 2010-2011 club season is now over, after last night's UEFA Champions League final, and Barcelona being crown European Champions. Cristiano Ronaldo ends the season with 54 goals scored in all competitions, while Lionel Messi ended with 53 goals. Barcelona defeated Manchester United with a 3-1 win, in the UEFA Champions League final, played in Wembley. After beating Real Madrid in the UCL semi-finals, the "Blaugrana" showed they were the strongest side against a non threating "Red Devils" side. For those who watched the game last night, one thing is for sure: Manchester United doesn't have the same powerfull striking force, when compared to the years when CR7 played for Manchester United. Lionel Messi added another goal to his tally, ending the season with a total of 53 goals, just 1 goal behind Cristiano Ronaldo's legendary mark of 54 goals in 2010-11. Cristiano Ronaldo managed to remain the leader of this season's goalscorer table, even though Barcelona's Lionel Messi also broke his own personal record in terms of goals scored in a single season. 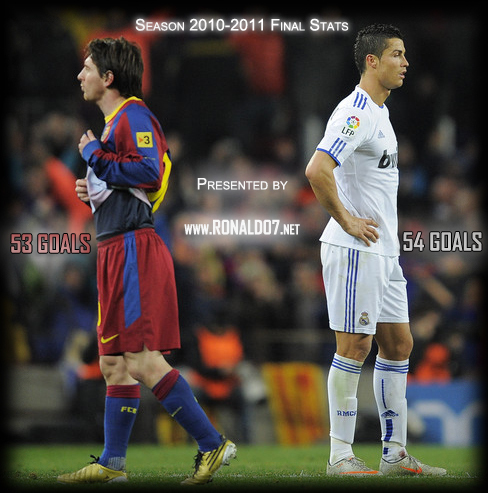 Below, you may check all 54 Cristiano Ronaldo goals in 2010-11, as well as Messi 53 goals througout this season.